Following the wonderful wedding of a very dear friend in the Lake District I travel next to Gloucestershire to see my cousin’s wife. Having read my blog, Maggie wants to give me a typical Cotswold experience to write about, so after picking me up yesterday from Stroud railway station she takes me for half a cider at Laurie Lee’s local pub, The Woolpack, immortalised in his autobiography Cider With Rosie. 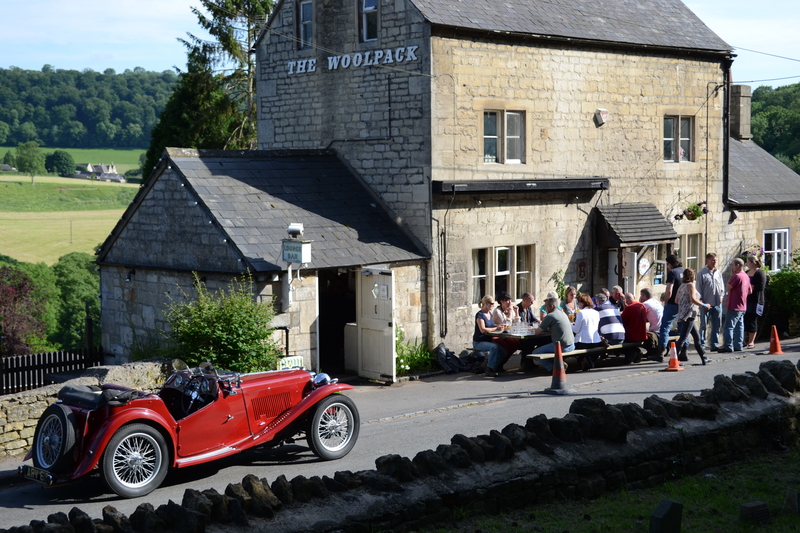 Right on a narrow winding road in luscious countryside, The Woolpack is a little slice of very well-preserved history dating back to the early 1640s. We sip our cider in the adjoining beer garden and then wander up to the Holy Trinity Church opposite for a look at Laurie Lee’s grave with its simple headstone surrounded by giant daisies: Laurie Lee 1914 – 1997 / He lies in the valley he loved. 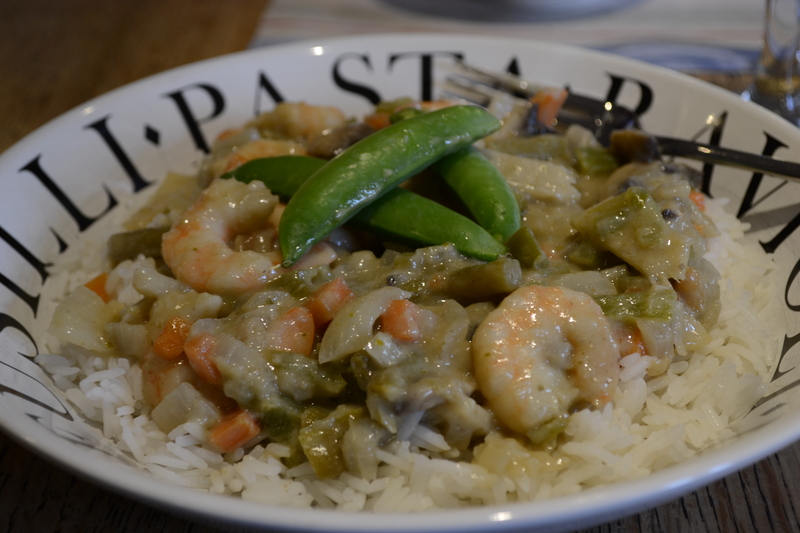 Back at Maggie’s in her fabulous farmhouse-style kitchen we sip champers and catch up on all the goss while she makes dinner – a yummy Loyd Grossman Thai green curry with onion, green pepper (capsicum for my Aussie readers), carrot, green beans, bamboo shoots and gorgeous big juicy prawns. 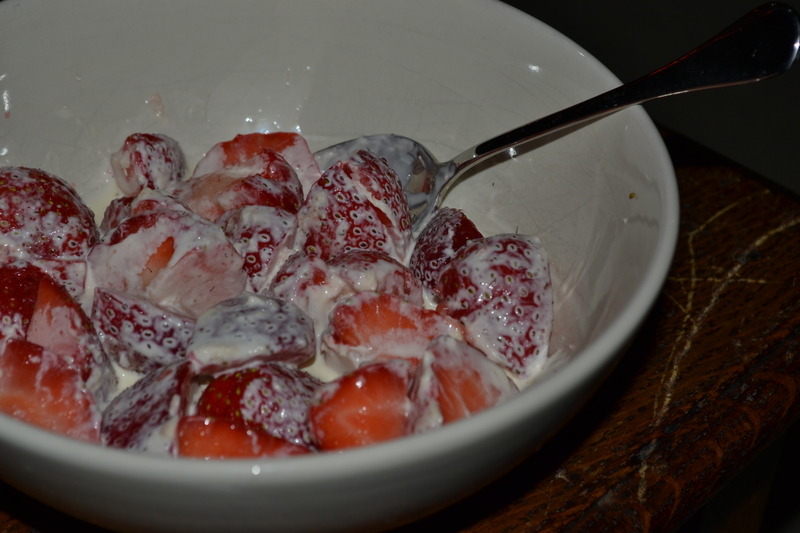 In honour of Wimbledon starting this week there’s strawberries and cream for pudding, and we cosy up by the fire with Amber, their beautiful golden lab, and fall asleep to rubbish on the telly. 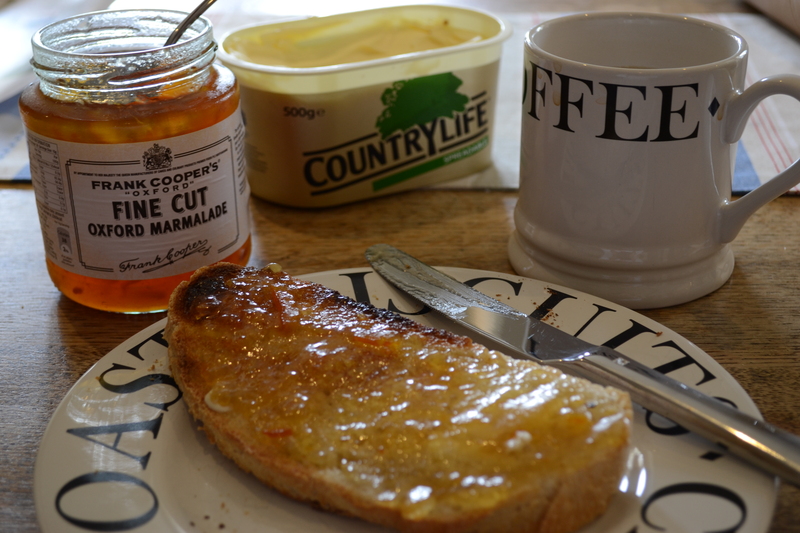 Next morning, after tea, toast and Frank Cooper’s Oxford marmalade (the best marmalade ever) for breakfast, Tom, my strapping godson, appears having arrived home late last night from a holiday with school friends. Before Maggie and I leave to take me to the train station there’s the obligatory annual photograph of Tom and I together to demonstrate how tall he is; at six foot three inches he stands more than a head above midget Aunty Caroline. I must remember to wear my highest high heels next time I see him! Bizarrely, one of the foodie things I most look forward to on my trips to the UK is Pret A Manger sandwiches. This is especially the case at Christmas time when they do a Christmas Lunch sandwich – a heavenly combination of turkey, great slabs of herby stuffing, cranberry sauce, mayonnaise, crispy fried onions and some token greenery to obscure the fact that you are actually eating pure lard. Sadly, being June, the Christmas Lunch sandwich is having a well-earned Summer holiday so, on coming across a Pret at Marble Arch at lunchtime last Thursday, I choose the crayfish with lemon mayo and rocket. Pret is a very well marketed brand, in my opinion. 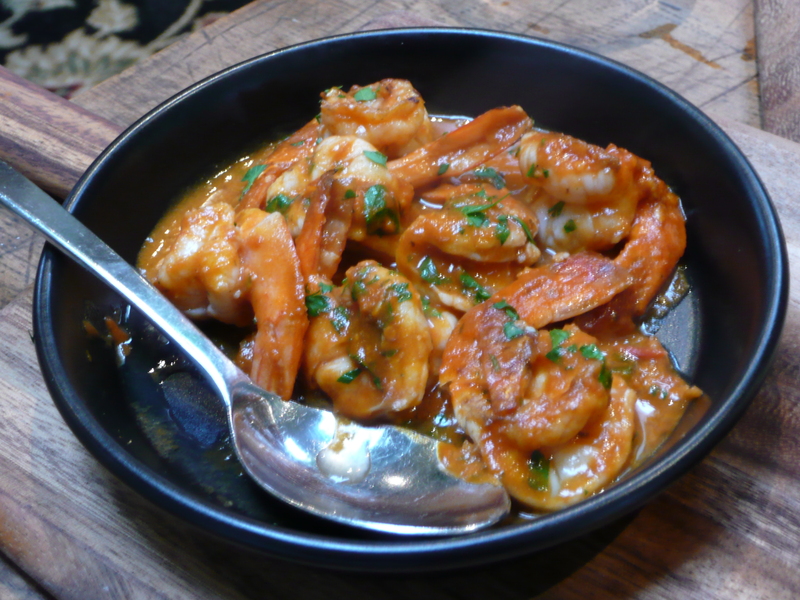 Their promise is freshness and flavour and boy do they deliver. The soft, grainy bread is generously filled with plump, tender crayfish and peppery, unwithered rocket, and the lemon mayo adds the perfect zing. Plus, in a perfect example of internalising your brand promise, the staff are so damn perky and helpful that you really think that Pret must be an awesome place to work, and that does add to the enjoyment of the experience. In the evening I cook dinner for Alex as a thank you for their wonderful hospitality. Laura is trying out a special diet that seems to consist mostly of mushed up aubergines so sadly she can’t partake of my culinary efforts. 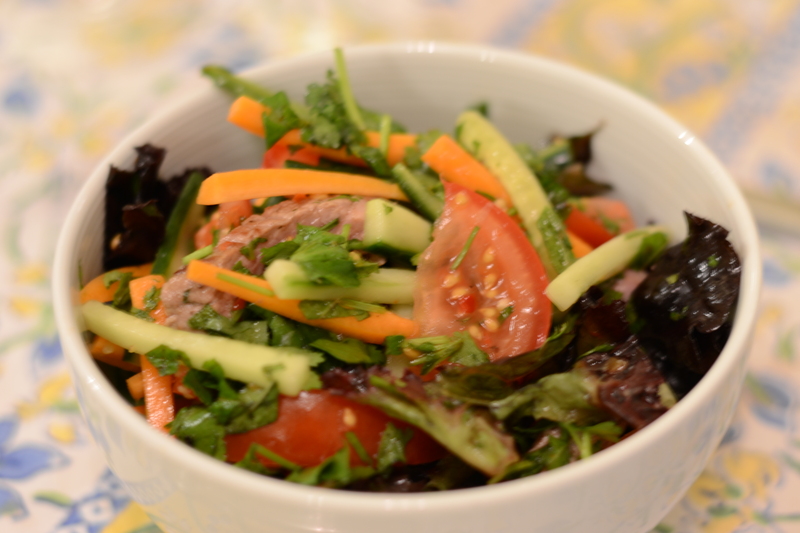 I make a Vietnamese beef salad from a favourite Nigel Slater recipe which I know by heart having made it so many times. Into a big salad bowl I put two ripe vine tomatoes cut into thin wedges, the equivalent of one large carrot and about 10cm of cucumber cut into matchsticks, some salad leaves (the recipe suggests watercress), a handful each of chopped fresh mint and coriander and one birdseye chili finely sliced (I leave the seeds in but I’m a chili freak). The only thing that’s missing that I didn’t manage to find at the shop is about four kaffir lime leaves which you’re supposed to de-vein, roll up tightly and then slice as thinly as you possible can. I love the flavour and fragrance that these add. I then prepare the dressing in a small bowl – the juice of a lime, two and a half tablespoons of sweet chili sauce, two tablespoons of fish sauce and a good pinch of sugar. All that remains is to cook the steaks – two lovely pieces of sirloin from the local butcher in Kew Gardens which earlier I’ve rubbed with some olive oil and sprinkled with black pepper. They’re not overly thick so I fry them in a very hot pan for just one and a half minutes on the first side and one on the second, grinding on some sea salt as they cook. After resting them for a few minutes I slice them into strips which are a lovely dark pink inside. I toss them into the salad along with the dressing and we’re ready to eat. Alex is so enthusiastic in his compliments that I’m really quite chuffed I chose this recipe. It’s a bowlful of vibrant flavours and textures with the crunchy vegetables, tender rare steak and sweet-sour-salty dressing, plus a good chili kick that really gives our sinuses a workout. For pudding we have beautiful fat raspberries (only £2 for a big punnet from M&S – in Oz they’re extortionately expensive) with half-fat crème fraiche and a light sprinkling of white sugar. And over a few glasses of white burgundy followed by a fruity little sauv blanc from New Zealand, we reminisce about an enlightening (for me, anyway) visit I made to see Alex at Oxford University 20 odd years ago. As the cliché goes (and increasingly so, the older we get), how time flies! Henni took the day off work yesterday so we could spend it together and lucky for us the sun came out and it was lovely and warm. After a lazy morning eating bagels with lemon curd and pottering around her flat we head off in Bertie, her gorgeous black convertible mini, to Richmond for lunch. Once Bertie is safely parked we meander along the high street having a little shufti in some shops along the way, and then turn down a lane towards the river. 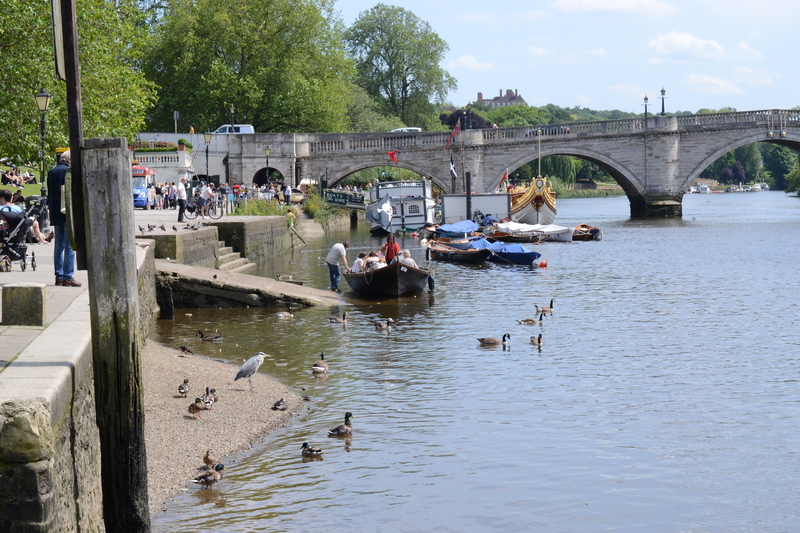 It’s lovely by the water – there are people out in boats and barges, cycling along the towpath or sitting eating al fresco at the pubs and restaurants that line the river. While I snap photos Henni grabs us an outside table at a pretty, old pub with hanging baskets called The White Cross. We both order a burger and chips and a glass of rosé, fast becoming the drink of the holidays. 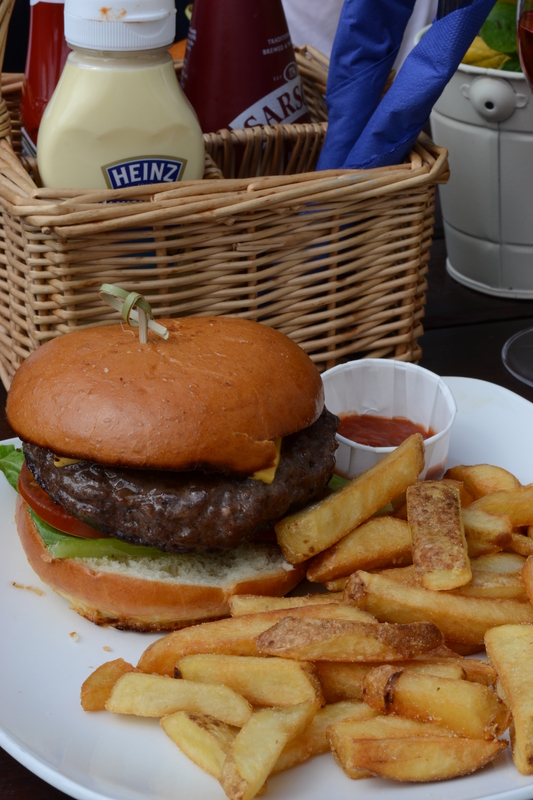 The burger is fat and juicy with good tomato relish and the rustic skin-on chips are the perfect combo of crunchy outsides and fluffy insides. The only disappointment is the shiny plastic square of processed cheese inside the bun. After lunch Henni puts me on the tube to Kings Cross to catch a train to Cambridge to spend the night with my old flatmate and great friend Jules. 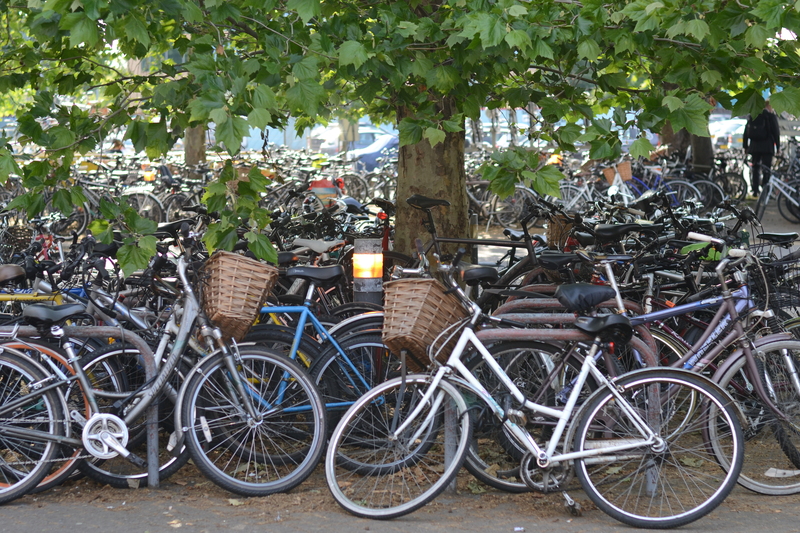 Coming out of the station at Cambridge I’m immediately struck by the sea of parked bicycles. I don’t think I’ve ever seen so many in one place at one time! We walk to Jules’s lovely house and then in to town to meet her cousin for dinner. Cambridge is so ridiculously picturesque with all its beautiful, old college buildings, people playing cricket in whites on the green and bicycles everywhere – proper civilized bicycles with an upright riding position and a wicker basket on the front. Needless to say we are about 15 minutes late because I can’t stop taking photos! 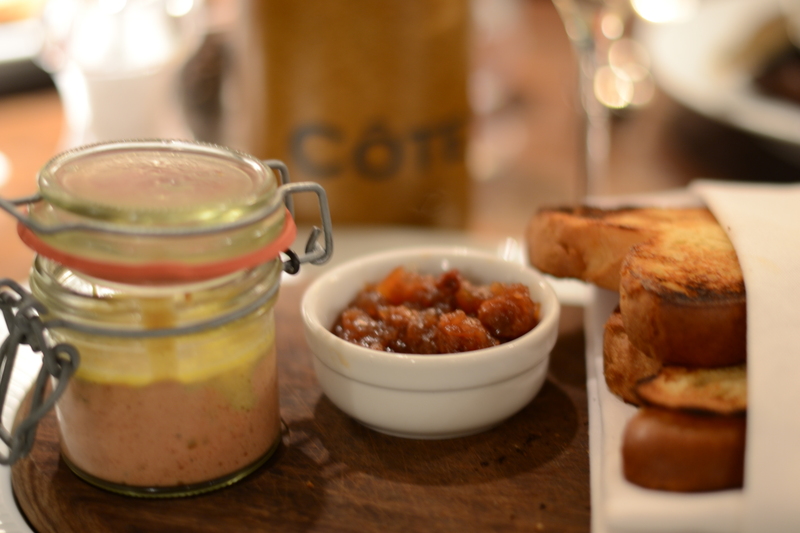 The paté is beautifully presented in its little glass jar and really delicious – makes me want to make it again soon which is surprisingly easy. The brioche is delicate and perfectly crisp-soft and the apple chutney is a lovely sweet, slightly tart accompaniment to the paté. 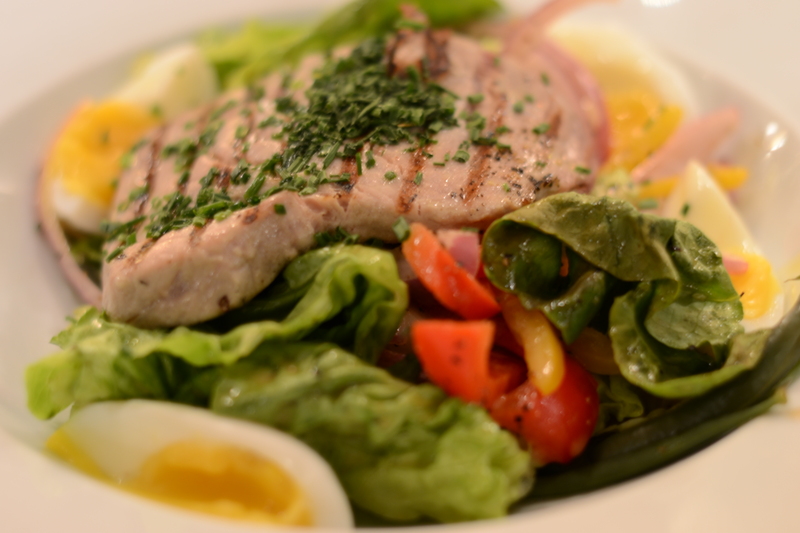 Having asked for my tuna in the salade Niçoise to be rare I’m pleased that they’ve taken me at my word. The salad is lovely and fresh with nicely al dente green beans and a little thinly sliced red onion which I always think I don’t want but which adds an essential base-note to the flavours. The boiled egg quarters are a delight to an egg-lover like me with their yokes still soft but not enough to run away. The only thing it all needs is a good grind of salt and pepper. After dinner we take a well-needed perambulation along The Backs (behind the colleges), over a bridge and back through town. Final exams over, all the colleges are having their May balls (even though it’s June) and from the bridge we can see two such events in full flight. Music blares out, search-lights fan through the night sky illuminating the majestic spires of Kings College, and gigantic white helium balloons bob from the perimeter of the enormous lawns heaving with carousing black-tied students. It takes me back more years than I care to admit to my own university days in Durham and our fabulous end-of-year balls. Mostly it makes me feel like going home for a cup of tea and a nice lie down – and that’s exactly what we do. So intent was I on writing my blog on Tuesday morning that I ended up running late (again!) to meet my old workmate, Catherine, for lunch in Chinatown. For years while we worked together, and every year I’ve been back to London since, we’ve eaten at Hing Loon on Lisle Street – and this time is no exception. We barely need to glance at the menu because, of course, we order the same thing we’ve always had – beef with chili in black bean sauce for me, bean curd in black bean sauce for Catherine, and boiled rice for two. The food at this tiny restaurant isn’t going to win awards any time soon but it’s great value (you can have a two-course set lunch for £5), the staff are friendly and you know exactly what you’re going to get. 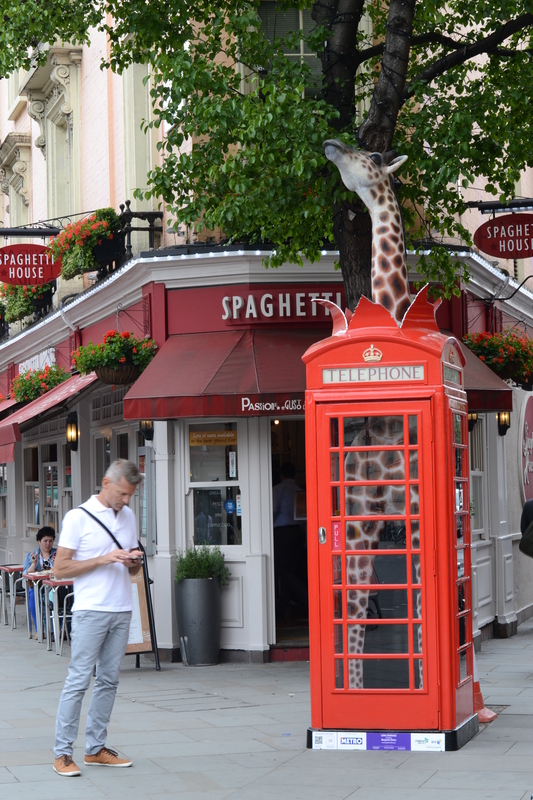 I don’t take any photos (motto from now on: ALWAYS take photos) so instead I’m going to post this curious shot of a giraffe in a telephone box! It’s one of a whole series of arty phone boxes that I proceed to enjoy snapping around the West End. After treating myself to a nostalgic scoop of Caramel Chew Chew from Ben & Jerry’s in Leicester Square I have the obligatory snoop round the shops up Long Acre. Call it a cynical marketing ploy if you like but I’m continually excited to see the extent of the patriotic fervour that has hit London. At M&S Food there are so many things packaged in Union Jacks and their famous pre-packed sandwich range has been infiltrated by such combinations as roast beef and Yorkshire pudding, pork pie and egg, and coronation chicken. 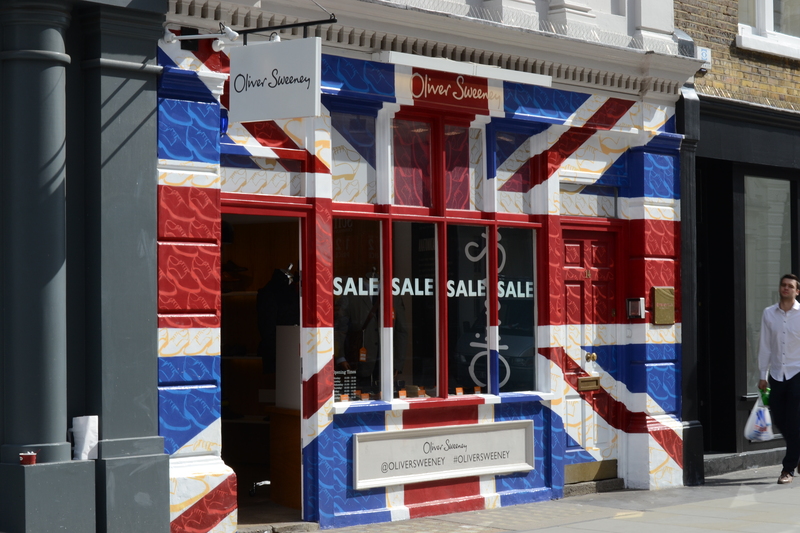 Hell, I even find a shop that’s just one big Union Jack! 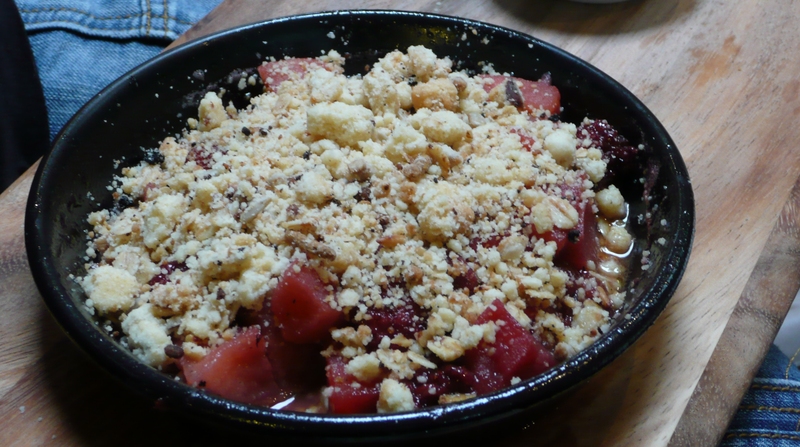 Anyway, I should probably write about some food now, given that’s what this blog is supposed to be about! 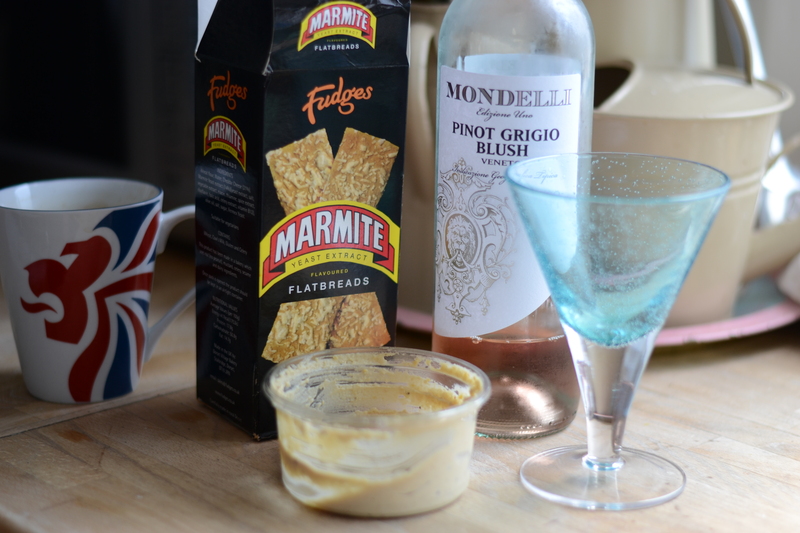 At my darling friend Henni’s in the evening we start off with a glass or two of rosé and some Marmite flatbreads dipped in caramelised onion hummus which is strangely yummy. 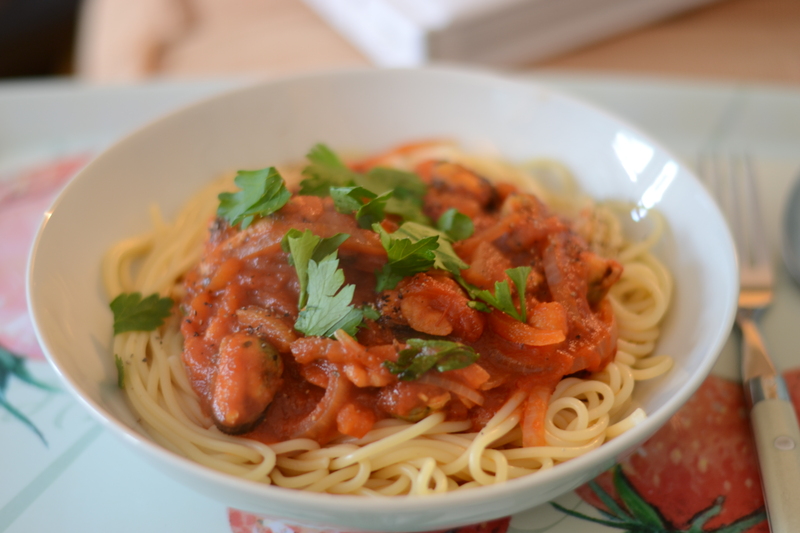 For dinner Henni has made one of my favourites – a beautiful seafood pasta with muscles, prawns, squid, onion, garlic, chili and tomato, sprinkled with flat leaf parsley. It’s tasty and comforting, and relaxing in Henni’s gorgeous flat and being looked after is just what the doctor ordered after two days of walking and being out and about until late. Afterwards I stretch out on the sofa under a rug and catch up on old favourites, EastEnders and Midsomer Murders. What bliss! Lunch yesterday was in my old stomping ground of Fulham with a very dear school friend, Robbo. My instructions to him were that I wanted to go to a good old-fashioned English pub for proper English pub grub. I’m rather glad that he has failed in that mission and takes me instead to a place called Del’Aziz, one of a small chain (new since my time) of deli/bakery/cafés purveying a wonderful range of produce and meals from the areas surrounding the Mediterranean Sea, including North Africa, the Middle East and the Balkans. It’s a warm, welcoming space with rustic wooden tables and chairs, charming staff, and such an array of colours from all the food on display. 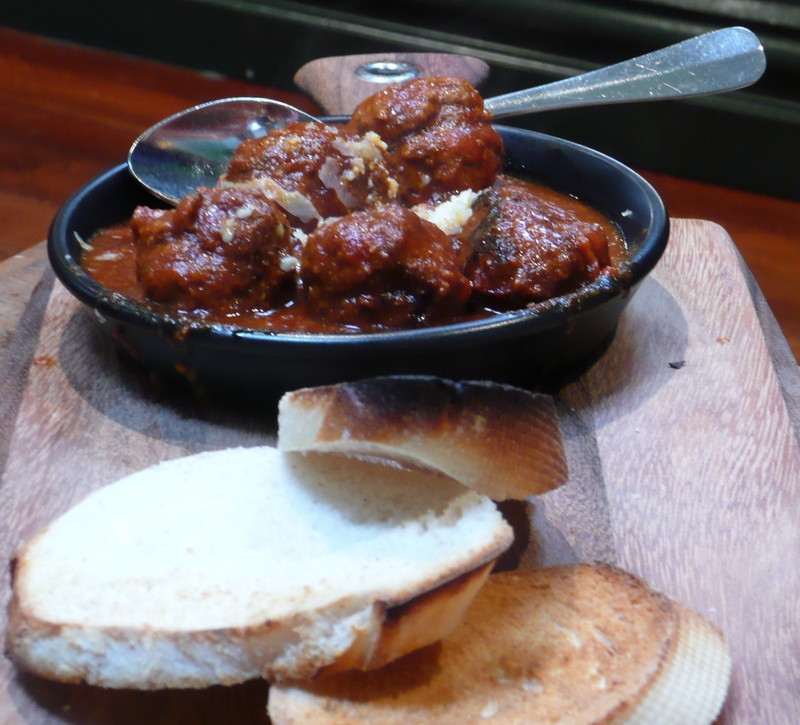 Robbo goes for the two course lunch and chooses beautiful salmon falafels with a red pepper (capsicum) dip, and char-grilled merguez sausages with couscous. 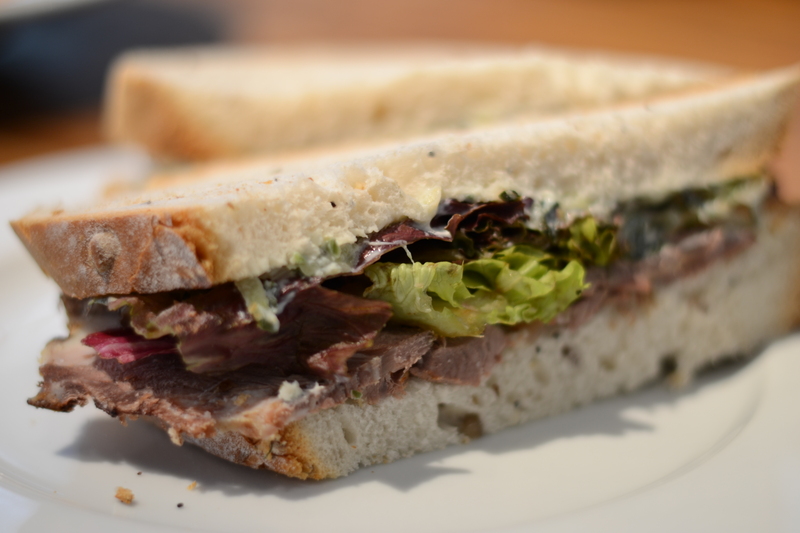 I am less hungry so opt for a sandwich on house-baked mixed seed bread with cumin spiced slow roast shoulder of lamb, tzatziki and salad leaves. (Just look at the shallow depth of field on this photo!) We both feel that the food is a little underseasoned, but salt flakes and ground black pepper are provided in little earthenware pots so that is soon fixed. I think it’s fair enough, with such lovely fresh food, to leave seasoning to personal taste. In the afternoon I trek miles along the Fulham and Kings Roads browsing in the shops, and end up in Peter Jones in Sloane Square to buy socks for my poor raw feet and have a sit down in the brasserie for a cup of tea and some free Wi-Fi. Then it’s on the tube again to meet Claire, one of my very oldest friends who I’ve known since we were four, in the West End. She asks me what I feel like eating and I say I’d really like to have a proper English curry while I’m over, so we head into Soho in search of Indian. I spent practically every Friday night of my six years in London in a curry house after several beers at the pub – it holds a very special place in my heart. And besides, they just don’t do Indian in Sydney like they do in London. We find Gopal’s of Soho on Bateman Street and looking at the menu outside it appears to fit the bill. Inside it’s all starched white table cloths and fanned napkins and that distinctly comforting smell emanating from the kitchen – perfect! We’ve barely sat down and ordered two large bottles of Kingfisher lager and the waiter reads my mind: “Four poppadoms?” Four poppadoms duly arrive with their accompanying chutnies and pickles in the rotating metal containers I remember so well – mango chutney, hot lime pickle, finely diced red onion and tomato, and that heavenly sweet combination of yoghurt with finely chopped mint and coriander. The poppadoms, as usual, fill us up too much but you can’t not have them! To follow Claire has lamb biriani, I have a chicken jalfrezi (for old time’s sake) and we share a muter panir (soft Indian cheese and peas cooked in a mild sauce). It’s all absolutely delicious but I’m a tad disappointed that my jalfrezi is not as “very spicy hot” as the waiter warned me. I’m absolutely gutted that I was so engrossed in the whole experience that I forgot to take any photos of the food, especially when I’m so enjoying my new lens. Those chutnies would have looked very pretty! Yesterday I met up with four girlfriends (two of whom I hadn’t seen in years) for lunch at Rocket in Mayfair. Mini A-Z and camera in hand, imagine my bunting-obsessed delight when I turn down a tiny lane and discover this little muse hidden at the bottom – oh so European and Brit-tastic all at the same time! I’m running late (owing to forgetting how long it takes to get around in London – and stopping to take photos!) and meet the girls upstairs in Rocket, a lovely light, airy, high-ceilinged room. The rosé is already in full flow and after hugs all round we get down to business – the menu. 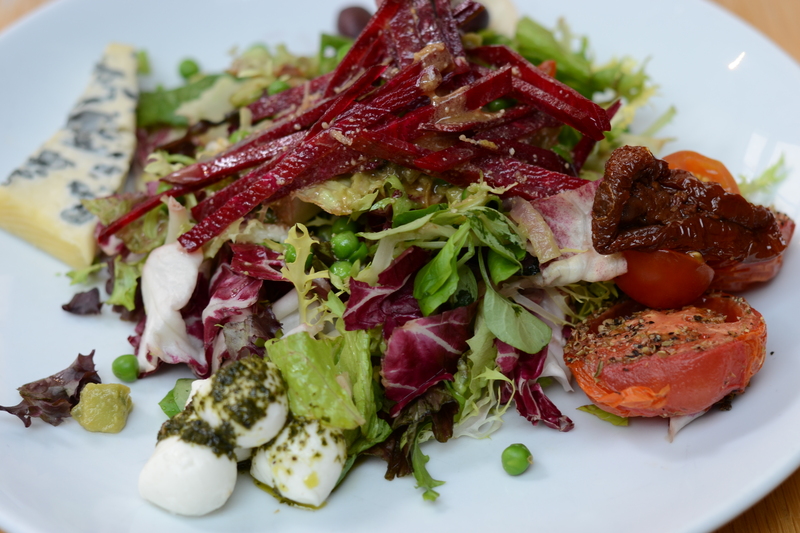 Three of our party go for delicious sounding gourmet pizzas, one for crab and crayfish cakes with hand cut chips, and I opt for a salad that has three types of cheese – St Agur, goats cheese and bocconcini – plus beetroot, avocado, pesto and roasted tomatoes. What’s not to love there! 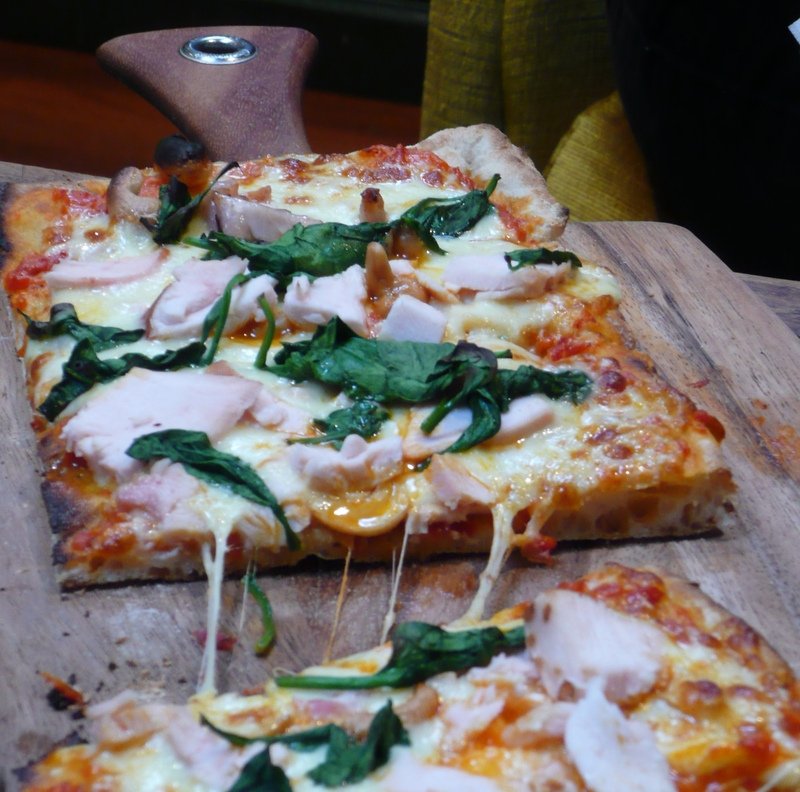 I’m a little bit excited to be posting one of the first food photos taken with my new fancy pants lens – ta da! (Nikon 50mm f1.8G, for the photography boffins). Quite a few bottles of wine, plus coffees, later it’s time to leave so that some can get back to their young children, left with their fathers for the day – well, it is Father’s Day! For Henni and I it’s time for a quick nose around the shops, and what better way to top off an already great day but to find the shoes I was hankering after online from Oz – still available, in my size and in the sale! Yesterday was the first day of my annual pilgrimage back to The Motherland and what a perfect British day it was! The weather (see, I’ve slotted straight back in), though mostly sunny, is windy and threatens to rain all day. My brother, sister-in-law, two small nieces and I all head off to the Kew Green Fete, a heart-warming collection of old-fashioned fairground rides and bunting-festooned stalls selling home-made cakes, crafts and vintage children’s toys and books. 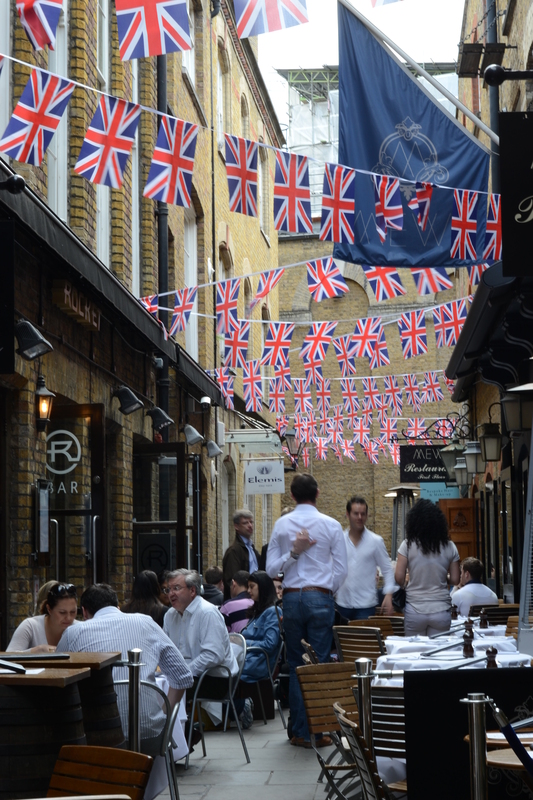 Still caught up in the Queen’s Diamond Jubilee fervour, even though I watched it all on telly from Oz, I buy two sets of hand-made Union Jack bunting. Laura buys, amongst other things, carrot cake, which I hope we’re having for breakfast this morning, and we all lunch on ‘organic’ hotdogs with onions, mustard and tomato sauce. On the way home we stop at a glorious little tea-house, with hanging baskets and yet more Union Jack bunting, for high tea. 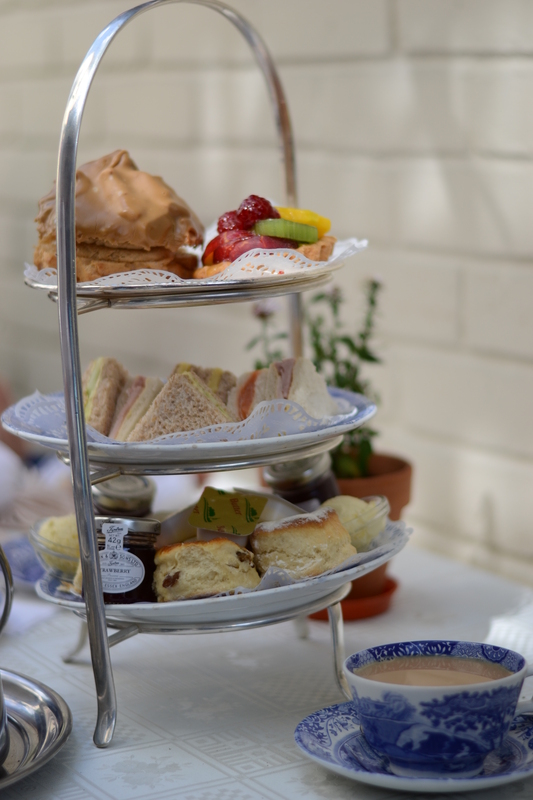 We have well-brewed Assam, made in a pot of course, along with dainty cucumber and smoked salmon sandwiches, some majestic looking pastries and, the pièce de resistance, scones with strawberry jam and clotted cream. In the evening Alex and I dine at their fabulous local Italian, Q Verde, where we’re looked after impeccably, as usual, by the very friendly maitre d’, Geraldo. Glass of prosecco in hand we study the menu and ask Geraldo what he recommends today. 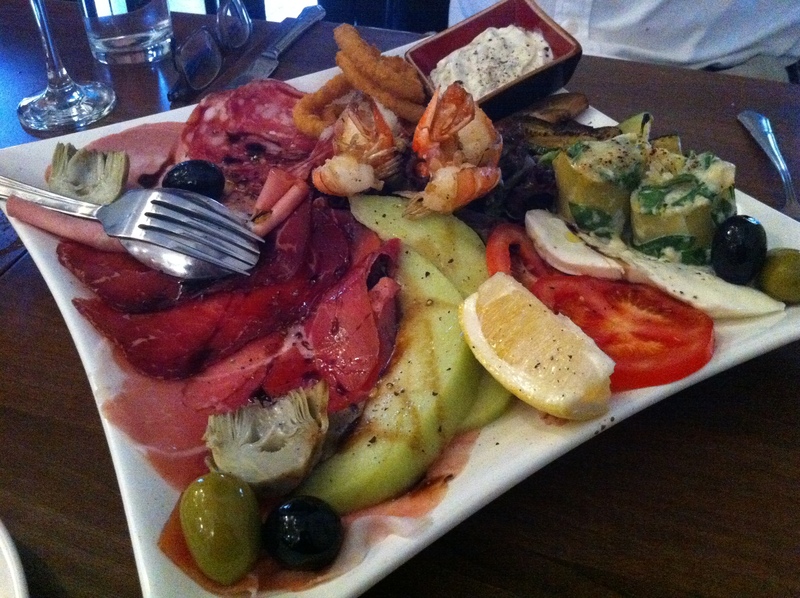 This is the second time I’ve been here and, like the first, we opt to start with a mixed antipasti platter groaning with everything you could wish for: prosciutto, salami, bresola, mortadella, grilled prawns, crumbed calamari, stuffed artichokes, grilled aubergine and courgette (zucchini), olives, melon, tomato and mozzarella. We follow up with saltimbocca alla romana for me, and calves livers for Alex. Both are very thinly sliced, cooked to perfection and served with sauté potatoes and al dente steamed vegetables. This is all admirably helped down by a lovely bottle of Nero d’Avola, a Sicilian red, poured into a beautiful glass decanter to mellow the flavours. Far too full for pudding, Geraldo insists on plying us with a couple of shots of grappa, on the house of course. In spite of the jet lag, curiously I sleep very well indeed! It’s the Queen’s Birthday public holiday and it has rained solidly from the moment I got up at 7am until now (which is 4pm) and it’s showing no signs of stopping. I am sitting at my computer, huddled around a heater along with racks of laundry slowly drying on a rotisserie basis. “A great day for cooking an Irish stew!”, I declared this morning, and braved the wet (eventually) in wellies and mac to buy ingredients up the road in Marrickville, officially the best suburb in Sydney. I am using a recipe, rather appropriately, by Irish cooking queen Rachel Allen so it ought to be good – although it’d be difficult to go far wrong with such a simple stew. I brown 1.5kg of lamb neck, which I asked the butcher to cut into thick slices (four per neck) until they’re beautifully caramelised. (It’s funny how ever since Masterchef came on the scene cooking is ALL about caramelisation!) 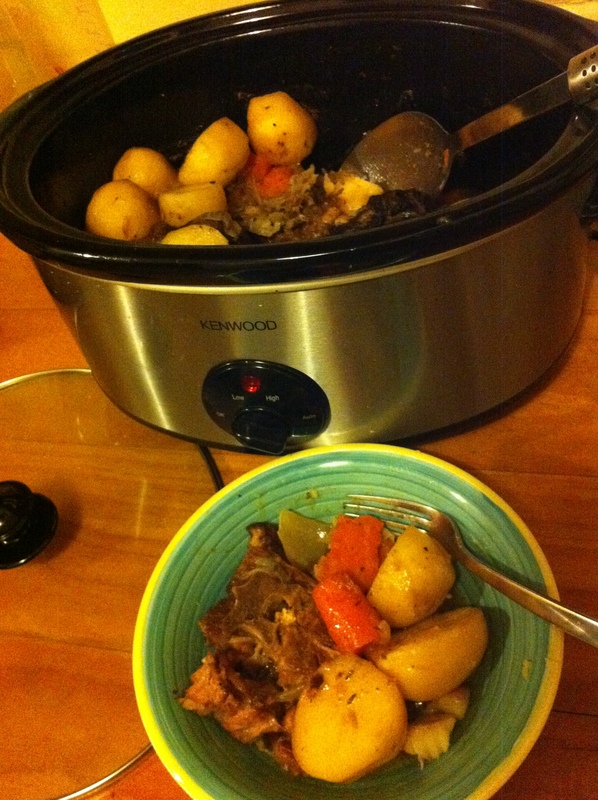 I put them in the bottom of the slow cooker. Into the still-hot olive oil go four carrots and two onions cut into chunks, plus eight cloves of garlic, peeled but not chopped. (The recipe calls for 12 baby onions, which would have been lovely and sweet, but they only came in huge bags at the local supermarket.) I sauté those for a few minutes, seasoning well, then add them to the slow cooker. On top of the meat and veg I add a few sprigs of thyme, more salt and pepper, 500ml of chicken stock and 100ml of water, plus 10 potatoes cut in half. It’s been cooking for an hour and a half so far and I intend to leave it for another three hours at least. Plenty of time for yet another pot of tea and a yoga class to restore some life to my cold, damp bones… Except that as it turns out there’s no yoga because it’s a public holiday, so instead I drink wine and paint my toes in preparation for my upcoming holiday! I take the lid off for the final hour since slow cooking retains a lot of moisture. If I was doing a proper job I’d finish by pouring off the liquid, chilling it with ice cubes or in the fridge, and scooping off the fat before returning it to the stew. But that’s way too much of a faff, and besides, we’re ready to eat. 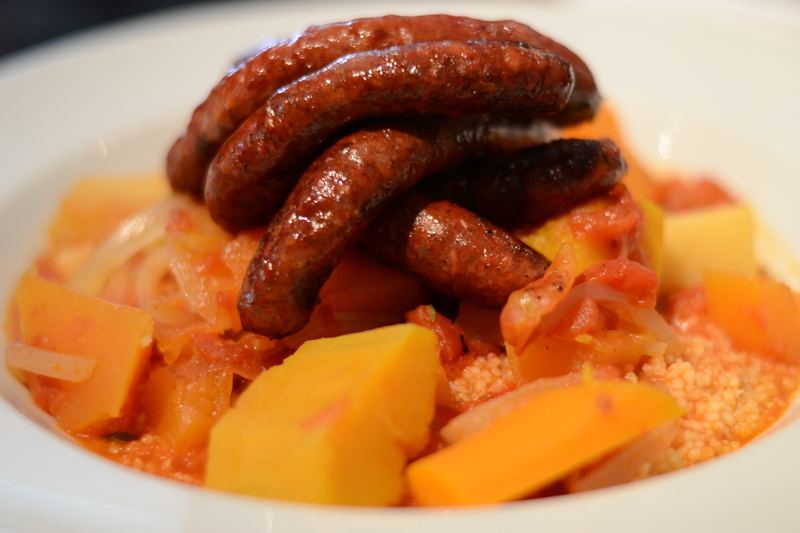 The overriding flavour of this stew is sweetness – the meat falling off its spiky bones, the gelatinous marrow in the centre, the soft cylinders of carrot, the layers of onion. 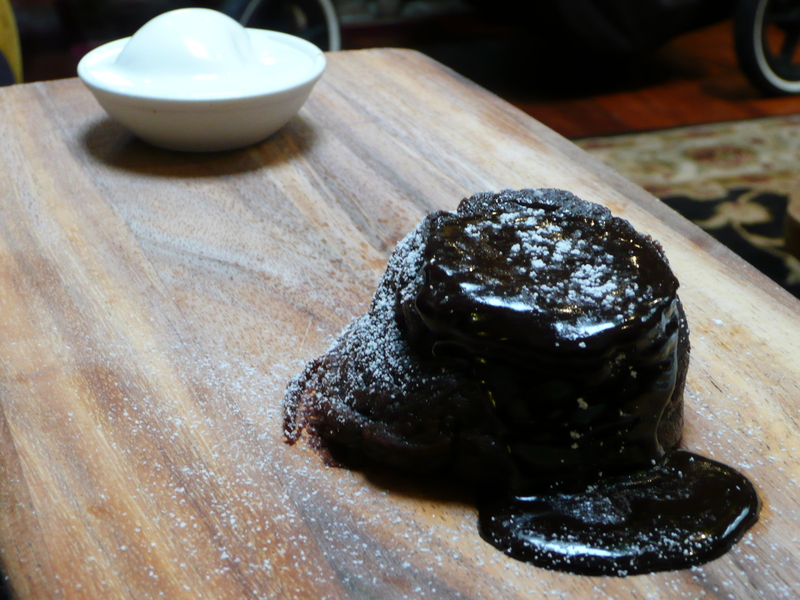 The fattiness gives it a richness, coating the mouth and no doubt sticking the ribs together! Desiree potatoes are the perfect variety for this stew – wonderfully waxy, almost fudgy – and mashed with a fork they provide the perfect blotting paper for all the lovely juices. I’m rather sorry I won’t be here to enjoy the leftovers which are now in the freezer, but hopefully going to Blighty in Summer I’ll be able to escape this incessant rain. Now that’s ironic!